Edgy industrial pendant features a group of irregularly domed reclaimed Aluminum stacked on a straight oxidized Sterling Silver wire with large ring at top. Affixed to the end of the pendant is one natural baroque Tahitian Pearl measuring approx. 13 x 9mm. The 8.8 cm. 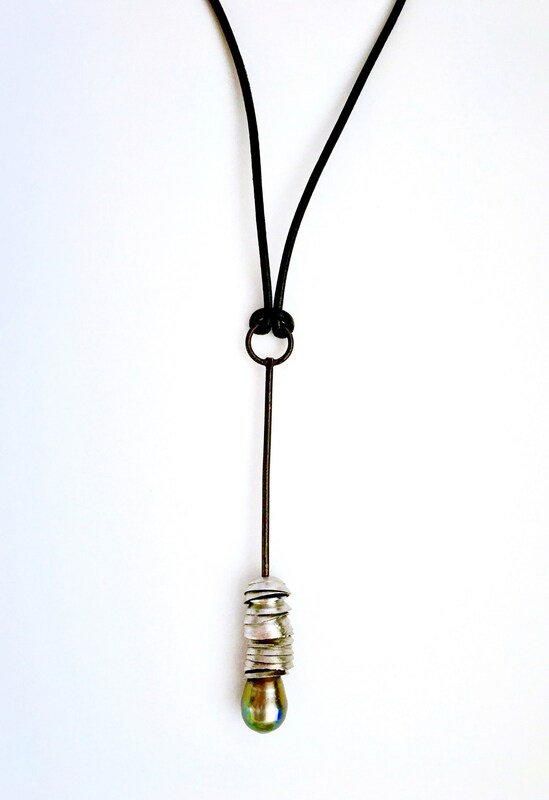 pendant is suspended from a 2mm black leather neckcord measuring 18” in length, with Sterling clasp. I love the challenge of re-forming and completely re-purposing random pieces of metal into eclectic jewelry, especially in conjunction with other precious materials. All metals have the potential to be beautiful and interesting, and in this case the Aluminum started off as some plain tubing that had been discarded in a commercial dumpster.